Few have been listening. NASA - be PREPARE! Calling it a "once in a lifetime super solar storm event," NASA warns that killer solar flares can slam the Earth knocking out the Northern Hemisphere's technological infrastructure and kicking everything back to the level of the late 1800s. The glowing plasma at the leading edge of our Solar System has recently increased 1000 percent. That higher-charged energy is in turn exciting the plasma and causing more of it to form, so you see more luminosity, more brightness. This energy is then flowing into the Sun, which in turn emits the energy and spreads it out along its equatorial plane, which is called the Ecliptic. All this is happening all at the same time and it's all working up to a crescendo where there is going to be a sudden shift. So, all in all, what we're seeing is a lot more than just what they call Earth Changes. Very, very few people are aware of the work that is being done in the Russian National Academy of Sciences in Siberia, specifically in Novosibirsk, where they are doing this research. Our entire solar system is entering an immense, "deadly", interstellar energy cloud! Terrified scientists at NASA discovered on July 14, 2010 that our system is passing through an interstellar energy cloud. This highly energized, electrified cloud of gas is disturbing and disrupting the sun. 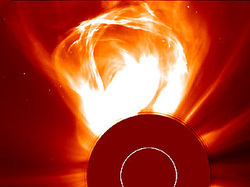 In conjunction with Earth's weakening and moving magnetic shield, the world is becoming defenseless against massive solar flares and intense radiation. NASA, the ESA and the National Academy of Science have issued an unprecedented solar storm warning for 2012. But what NASA and the federal government are hiding, according to Demetriev, is that the sun—and everything in our solar system—has plunged into an alien, unknown photon cloud...a belt of danger that could precipitate gigantic solar explosions, magnetic anomalies, careening cometary masses and destabilize the orbits of some asteroids. "The Russian scientist further claims this cloud of energy is exciting the atmospheres of our planets and especially our sun. As this interstellar energy cloud continues to excite/charge the sun, it causes the sun to become more active, resulting in greater output from the sun". Earth's moon is growing an atmosphere Also, the moon is growing an atmosphere that's made up of a compound Dmitriev refers to as ''Natrium.'' Dmitriev says that, around the moon, there is this 6,000- kilometer- deep layer of Natrium that wasn't there before. And we're having this kind of change in Earth's atmosphere in the upper levels, where HO gas is forming that wasn't there before; it simply did not exist in the quantity that it does now. It's not related to global warming and it's not related to CFCs or fluorocarbon emissions or any of that stuff. It's just showing up. Magnetic fields and brightness of the planets are changing. The planets are experiencing sizable changes in their overall brightness. Venus, for example, is showing us marked increases in its overall brightness. Jupiter has gotten to have such a high energetic charge that there is actually a visible tube of ionizing radiation that's formed between its moon, Io. You can actually see the luminous energy tube in photographs that have been taken more. Jupiter's magnetic field has more than doubled. Uranus's magnetic field is changing. Neptune's magnetic field is increasing. These planets are becoming brighter. Their magnetic field strength is getting higher. Their atmospheric qualities are changing. Uranus and Neptune appear to have had recent pole shifts. When the Voyager 2 space probe flew past Uranus and Neptune, the apparent north and south magnetic poles were sizably offset from where the rotational pole was. In one case, it was 50 degrees off, and in the other case the difference was around 40 degrees, both of which are pretty big changes. The overall changes could essentially be broken down into three categories: Energy field changes, luminosity changes, and atmospheric changes. Dr. Dmitriev did a very elaborate calculation of natural disasters. He showed that if you compare the years 1963 through 1993, the overall amount of natural disasters of all different kinds - whether you are talking hurricanes, typhoons, mud slides, tidal waves, you name it - have increased by 410 percent. There's a study by Dr. Mike Lockwood from Rutherford Appleton National Laboratories in California, who has been investigating the Sun. He has discovered that since 1901, the overall magnetic field of the Sun has become 230 percent stronger than it was before. More than just Earth Changes So, all in all, what we're seeing is a lot more than just what they call Earth Changes. Some people get into the idea that there is an interaction between the Earth and the Sun that's going on here. Very, very few people are aware of the work that is being done in the Russian National Academy of Sciences in Siberia, specifically in Novosibirsk, where they are doing this research. They've come to the conclusion that the only possible thing that could be causing this energetic change all throughout the Solar System is that we are moving into an area of energy that is different - that is higher. The glowing plasma at the leading edge of our Solar System has recently increased 1000 percent Now, check this out. The Sun itself has a magnetic field, of course, and that magnetic field creates an egg around the Solar System, which is known as the heliosphere. The heliosphere is shaped like a teardrop, with the long and thin end of the drop pointing in the opposite direction from the direction that we're traveling. It's just like a comet, where the tail is always pointing away from the Sun. The Russians have looked at the leading edge of this heliosphere, and they have observed glowing, excited plasma energy there. This plasma energy used to be 10 astronomical units deep (an astronomical unit is the distance from the Earth to the Sun, 93,000,000 miles). So ten astronomical units represents the normal thickness of this glowing energy that we used to see at the front end of the Solar System. Today, that glowing plasma has gone to 100 astronomical units deep. Although Dmitriev's paper does not give an exact timeline, we can assume that this increase happened in the same 1963 to 1993 period as the increase he found in natural disasters. Whenever it happened, that's a 1,000 percent increase in the overall brightness of the energy at the front end of the Solar System.